Freejobalert service is now discussing the latest UPPSC teacher recruitment notification 2018. The latest notification has released from UPPSC for recruiting 10767 teaching posts. 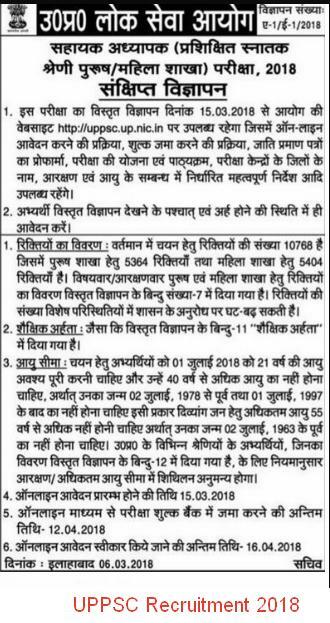 Licentiates Grade Assitant Teacher will be filled by this recruitment of Uttar Pradesh Public Service Commission. 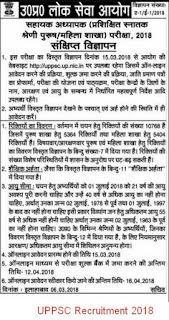 Post name & Vacancies: In this UPPSC teacher recruitment, 10767 Licentiates(LT) Grade Assitant Teacher will have recruited. Educational Qualification: Candidates who want to apply for this recruitment to be a Licentiates Grade Assitant Teacher, candidates must be graduate with the respective subject with the B.Ed or equivalent. The subjective teachers will be recruit by following subjects. Agriculture, Math, Hindi, English, Mathematics, Commerce, Computer, Home Science, Music, Physical Education, Science, Social Science, Sanskrit, Urdu, Biology and Art. For Computer teacher: Candidates who want to apply for computer teacher of this UPPSC recruitment 2018, the candidate must have B.ed degree. And also, the candidate must have one of the below degrees. 3. BE/B.Tech in Computer Science. Age Limit: Job aspirant who wants to apply for this latest UPPSC teacher recruitment should be between 20 to 40 years. Though, the candidate from a reserved category like Sc ST and OBC will get 5 years upper age relaxation. Age will be calculated as on 1st January 2018. Exam Fee: To participate in this UPPSC teacher recruitment 2018, candidates have to Rs pay 105. Handicapped candidates can apply by paying only Rs 25. Selection Procedure: UPPSC will select teachers through written exams and a personality test. Application Dates: The application procedure has not started. It will start on 15th March 2018. And you can apply form 15th March to 16th April. Notification:- Here is the notification. How to apply: Log on the official website of UPPSC and fill all details with your signature and recent passport photocopy and finally pay exam fees as per your categories. Follow the official site of UPPSC for online application link or keep visiting Freejobalert Service of nokria for further updates on UPPSC teacher Recruitment 2018. You may check more latest recruitment notification like Railway Recruitment, SSC recruitment or check all notification which discussed by Freejobalert.